A BAN on traffic outside two primary schools during certain times of the day could be rolled out across Midlothian despite opposition from teachers. The School Streets project saw drivers restricted from the area around the two schools during the times when pupils are travelling to and from the buildings. It aimed to crack down on youngsters being dropped off directly outside the schools and cut the number of vehicles turning in the streets as other children arrived on foot or by bike. 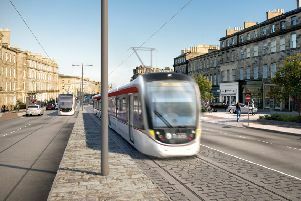 However, a report which will be presented to Midlothian councillors this week revealed that the biggest group of objectors to the scheme were teaching staff – who were also banned from driving to their work. The pedestrian and cycle zones created outside King’s Park Primary School in Dalkeith and Lasswade Primary, Bonnyrigg, have been in place for over a year as part of a trial. Councillors are being asked to approve a permanent introduction of the scheme at the schools. Officials are recommending other schools are also invited to apply to introduce the scheme in their own streets. A report to councillors revealed that the majority of parents and carers, local residents and senior pupils surveyed about the School Streets project supported it. The council’s will decide on the the scheme today.